The Frequency Generation Dual Frequency Zapper is built to fulfill all of Dr. Clark's published zapper specifications, while adding features that make it easy for you to keep zapping. 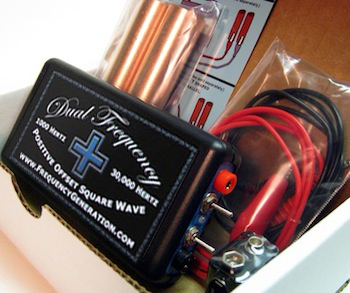 Unit produces a minimum 1/4 volt Positive Offset Square Wave at 1 kHz and 30 kHz using a 9 volt battery. The green LED turns red when battery is low. The battery snap is hard plastic, not soft vinyl that can rip after a few battery changes. Easy open battery door. No screwdriver needed to change battery. Lifetime repair or replacement guarantee for the unit. Wear and tear on copper handles, cables and 9-volt battery are not covered by the guarantee. No returns or refunds on working equipment. 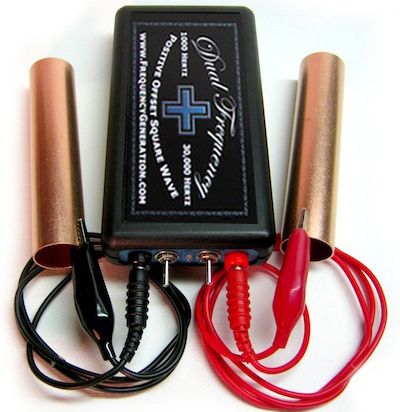 The Frequency Generation Dual Frequency Zapper Unit comes with a pair of copper handles, a pair of banana to alligator leads, a 9-volt battery and set-up instructions. If you are pregnant or wearing an electronic pacemaker, please do not experiment with a Zapper.